It’s a classic Sesame Street bit from 1975. Grover stands close to the camera and says, “this is near.” He runs away and bellows, “this is fa-a-a-a-ar.” He gets increasingly exasperated as he has to keep explaining in this way running back and forth. If you haven’t seen the bit…how the hell haven’t you seen the bit? Seriously. You’ve at least heard of it, right? I bring up the bit as a way of contrasting the two books this month in the Great Hugo Read. Your copy of I Am Legend? That is near. Your copy of The Forever Machine? That is far. I’m talking about the distance that the narrators holds himself from the story in each case. I Am Legend holds the camera very securely on Robert Neville’s shoulder through the entire novel, never leaving, never deviating. It’s the most limited of third person narratives. Only by slipping into first person could it be any more inside of Neville’s head. It’s perhaps telling that the story is of such narrow third person that, between my first listening in 2007 and rereading it this month I could swear I remembered the story in first person. This is the right place for the story to sit. A limited third person is a powerful tool for horror, as it grounds the reader in the perspective of the character. A wider look provides too much clarity, imposing a logical distance. In the case of I Am Legend, a broader or even omnipotent third person would give too many looks at what the true motivations of the vampires are, and just who Ruth is and what she represents far earlier than the book can take. The hammer blow realization of the end of the book would be destroyed by anything but the tightest of third person views. While there are many successes withing I Am Legend, this choice of voice is the underlying current that feeds the story’s urgency and makes the ending what it is. Thus far this month I’ve avoided talking about They’d Rather Be Right aka The Forever Machine (I’m going to use the latter title because it’s on the copy I read, and I like it better). One might guess it’s because I wasn’t nearly so over-the-moon about the book as I was with The Demolished Man, and one would be exactly right. As I mentioned several times leading into this book, no other novel even enters the discussion when asking which was the weakest Hugo winner. I was worried this knowledge would prejudice my reading of the book, but as I started I wasn’t sure what I was missing. Was I too enamored with any literature in my current reading splurge that I don’t recognize bad quality? It certainly wasn’t a pinnacle of English literature, but it was better than many books that I’ve read from the time period, thanks to my fascination with Ace Doubles. I am 40 pages out of 190 or so in, and I don’t yet see why it receives so much negative criticism. Perhaps it is still too early for me to make a judgement. There was something far too amateur about the writing. i didn’t recognize it until I got farther along in the story. I’m not sure amateur is quite the right word. I’d say “distant.” Much like Grover, the story gets farther and farther away. Unlike Grover, it was me getting increasingly exasperated with this. The scope broadens to the national, then international, reaction to the news that this immortality technology exists. It asks questions of who does and doesn’t deserve immortality, who is and isn’t ready for it, a point the authors focus on, even making it the subject of the climax. We still see the small band of inventors who the book followed at the beginning, but less and less. Their conversations are frequently summarized rather than played out through dialogue. Entire speeches are told about, not shown. Oh god, I, David Thurston of all people, am getting on a story for telling instead of showing. Do you see what this book has done to me‽ It even made me use an interrobang! The problem isn’t even taking a wide, even international, view of a story. I’ve read novels that have employed that to great effect. War with the Newts comes to mind. It’s another novel that starts with a main character then rapidly branches out to an international scope with only occasional dips into more personal stories. And does it to good effect. The difference being that Newts creates an international conflict whereas Forever Machine only creates an international philosophical dialogue. To put it frankly, the entire second half of the book felt like a detailed outline for what should have been the latter two thirds of the book. It’s as though the writers wanted to show off this technology, itself based as much on philosophy and magical thinking as science, then talk about their ideas of who does and doesn’t deserve the chance to live forever. Philosophy in science fiction is fine. This isn’t a screed against philosophy in sci-fi at all, the genre has a long history of providing voice to such ideas and ideals. But that can’t be the end all and be all of a story. There has to be…a story in the story. So there it is, the flaw in The Forever Machine. I cannot say it’s the weakest novel to win the Hugo, just because I’ve now read only six Hugo winners. I can say it’s the weakest of those six. It backs off from the story, where I Am Legend stays with it. The latter could very well have explored the vampire society being set up, gone through the debates about what to do with Neville. But it didn’t. Because that’s not its story. Its story is of one man alone in a changed world. The Forever Machine never entirely works out what its story is, which is unsatisfying. Though it is an interesting way to start the Great Hugo Read. I feel like the first two books create brackets. Will I come across books I like more than The Demolished Man? Probably. Will I come across books I dislike more than The Forever Machine? Possibly. But I feel like I’ve now got some range of expectations. Now to see where Double Star falls in that spectrum. This is taking a long view of the Great Hugo Read. Then again, the whole event is based on a long view. With the last book scheduled for November 2021, talking about 2017 doesn’t feel nearly so far away. In 1986 and 1987 a writer pulled off a previously unheard of feat. He won both the Nebula and the Hugo awards in consecutive years. 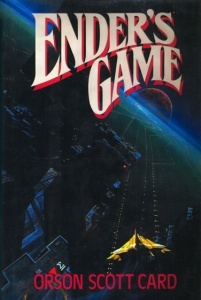 The novels were Ender’s Game and its sequel Speaker for the Dead, and the author in question was Orson Scott Card. Due to the Hugo wins, these two books are the October and November, 2017 books for the Great Hugo Read. This will not change. The purpose of the Great Hugo Read is completion. Every Hugo winner, mostly in order. See what people were reading and felt worthy of the high honor. Of course, Card has a tendency to visit the headlines every few years, largely due to his views on homosexuality and gay marriage. He has, since 2009, been a member of the Board of Directors of the National Organization for Marriage, a group built out of supporting California’s Proposition 8 and has a history that I am not going to recount on this blog. The executive summary is that he’s been continually willing to voice opinions that have made him rather unpopular. He’s reentered the news these last two weeks as DC (the comics, not the city) has brought him on as a writer for two chapters of an upcoming series of Superman graphic novels. The result of this announcement? Boycotts of the comics, petitions to remove his involvement in the franchise, and counter donations planned for marriage equality organizations, similar to those made by some to “offset” their purchases of Chick-Fil-A sandwiches. These protests are reverberating in Hollywood, where there is now some concern whether the big budget film adaptation of Ender’s Game can expect some of these same protests. I do not support Orson Scott Card’s views. I never have, I likely never will. So I’ll admit no small internal conflict with his two books on the 2017 Great Hugo Read schedule. I’ve read only one Card book in the past, Wyrms, largely out of curiosity. Readers, film viewers, theater goers, any supporters of the arts, have varying abilities to separate the artist from the art. Some can clearly and simply compartmentalize the two, some cannot. I have some entertainers I can divorce from their opinions, some I can’t. I’m not interested in providing a run down, that’s not the point. The point is, neither of these positions is more right or wrong than the other, and not wishing to support someone financially whom you stringently disagree with politically is any media consumer’s prerogative. But what is one to do when their distaste for a particular creator runs headlong into another goal?May I recommend a solution? A solution that exists not only in shopping centers across the country, but also through online retailers. A solution I, myself, intend to employ when it comes to these two books.Buy them used.Used book sales generate no royalties to the original author. Instead the sale price entirely supports a local business owner within your community. It’s a nice compromise position that readers have available, letting them read a piece of literature without providing any financial benefit to the original author. I wouldn’t typically highlight this particular element of used book stores as a feature, but in this case, perhaps it is.Now, this event isn’t so massive that I think we’ll make any kind of difference by protest buying copies used rather than new. But it does make me feel better, and I hope it makes you feel better too. If even that feels like providing too much support, then feel free to skip those months and join us again in December when we pick up David Brin’s The Uplift War.For now, I’ll look at the distance both The Forever Machine and I Am Legend stand away from the characters and the action, then in March we start in on the first of five Robert Heinlein books scheduled as part of the Read. Thank god there’s no controversy there. It’s well past the middle of the month, so let’s sit down with this month’s entries in The Great Hugo Read. 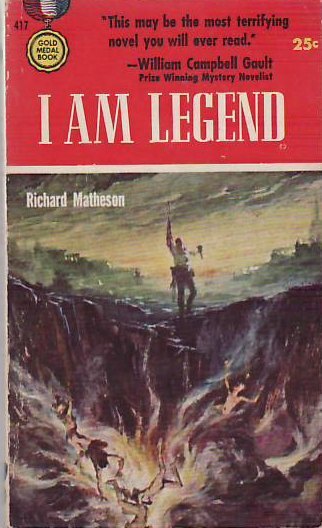 I’d like to start today with the secondary read, Richard Matheson’s landmark vampire novella I Am Legend. Specifically, I’m looking at chapters twelve and thirteen of the novella, which focus on lead character Robert Neville’s attempts to befriend a dog he sees scavenging in his post apocalyptic Compton neighborhood. These chapters stand out from the novella because…well, they stand out from the novella. They present a largely contained subplot of the larger narrative, a short story hiding in the novella. This shouldn’t surprise. While there is an arching narrative to I Am Legend, it’s primarily an episodic novella, jumping years at a time in between its sections. But there was something about the story of the dog that stood out even more. First, there’s the manipulative. I’m not going to accuse Matheson of being intentionally manipulative by introducing an injured dog into the story, but few things tug at the heartstrings of a human reader than an injured dog. And it does manipulate Neville. He trusts the dog so much more than he initially trusts Ruth. This is understandable, dogs can’t lie to us the way people can. They don’t delight in our pain the way cats do. They don’t just sit in cages and wait food to eat or a finger to bite like every other mammalian pet does. And they’re not fish. It’s trite to say that dogs have a special relationship with humanity that no other animal species does, but within fiction this is important to remember. Second, there’s the hope. Leading up to chapter twelve, Neville has been on a downward spiral. I joke that the I Am Legend drinking game is to take a drink every time Neville does, which will get you pretty damn wasted in the early parts of the book, even if you’re stopping to detox after every chapter. The dog is the first reason Neville is given to keep going, the first thing outside of himself to care about. Until then his life was staying alive, but the dog gives him a focus of keeping something else alive. Through the dog he starts getting better. It’s a very hopeful moment for a character surrounded by death and undeath, utterly alone in the world. I Am Legend is, at its heart, a story about isolation, just as much as any deserted island story. Introducing any additional characters into these stories, even if they aren’t human, even if they aren’t even not sporting equipment, changes the dynamic of the stories. And changes the characters. The dog is the first of two transformative elements in I Am Legend, and it’s the first chance to see Neville changing for the better. In a week the dog was dead. That’s it. Seven words on a line by themselves at the end of chapter thirteen. In a week the dog was dead. I am trying to remember any sentence in any other novel that has so put me in the position of the character. I can’t. Through two paragraphs the readers are shown Neville befriending the dog, fretting over it, hating himself when he scares it away, being terrified when the dog is injured, triumphant when he finally gets it into his house, despondent when it still shies away from him. And then, in a week the dog was dead. In those seven words we experience Neville’s world completely. Just as he cared about the dog, we’d cared about both it and him. The rug is then pulled out, hope dashed, and both Neville the character and we the readers see just how hopeless his world is. Neville goes on to deal with the loss of the dog, with trying to trust hope again when Ruth shows up (spoiler alert, the theme of the novella is that hope will STOMP YOUR HEART INTO A PASTE ON THE SIDEWALK AND LAUGH AS IT DOES SO…well, that and the dual nature of humanity and how do we define “other”). It’s an episode that continues to inform his character, as any portion of an episodic larger work must. But it’s also an episode that stands alone so well on its own, pulls in so much of what make I Am Legend the masterwork it is. Not every novel is going to have these moments, these little hidden short stories. They’re great for readings, they’re great for sharing, but they don’t always work. To come across one so bang-on is like a little present hidden within the story. We’ll see more of these later in the read when we get to Gaiman’s American Gods, but those are asides to the story, background to the story, not a piece out of the middle. Sure, I can’t imagine American Gods without them, but they’re a different beast. As we close out month two of the Great Hugo Read, I’d still like to do a compare and contrast of I Am Legend with The Forever Machine, look at the flaws in the latter that give it the reputation of weakest Hugo winner, and do some looking ahead to some potential controversy in 2017’s schedule. Until then, the Nebula Award nominations have posted, and may give some hints as to what we’ll be reading between April and August. If I had to make a guess from that list that we’ll see nominated come April, I’d say look for a copy of 2312. So it wasn’t just a one-time campaign in the 1960s to get people to drink a cold beverage hot to push sales in lean months. This is still a thing. That they still suggest you try. So I figured…why the hell not? Now, I didn’t have all of the ingredients on hand. Namely, I didn’t have Dr Pepper or a lemon. One might observe that I didn’t have any of the ingredients on hand, and perhaps that’s fair. I did have a 12-pack of Dr Pepper taste-alike Dr. Bob. It’s long been my favorite Dr Pepper clone. As that review states, it’s a little dryer, which I think is what I like about it. I also had orange juice. I also had rum. Simple recipe. I put just enough orange juice in the bottom of two mugs to cover the bottom, probably not even a tablespoon. I heated the Dr. Bob until it was steaming. Then I poured it over the orange juice. The result is something similar to a toddy, and perhaps an interesting alternative to an evening coffee or tea for someone who, like me, doesn’t like coffee or tea. The flavor was subtly different that Dr Pepper (or Dr. Bob) on its own, thanks to the added citrus. It was fine, but there was something missing. That’s where the rum came in. I added just a capful, not even a shot. That’s what turned the drink from an interesting experiment into a quite delightful toddy. Something that I actually would serve at a party. Ramp up all the ingredients, put it in a crock pot, and not tell people what they’re drinking until after they’ve decided if they like it or not. Maybe I’ll even try it with the correct ingredients, not just those I happened to have on hand. So drink up, it’s a cold few months ahead, and this is surprisingly good. Alright, the prophecy of St. Malachy is likely complete bunk. There are no written references to it until 1590, 450 years after Malachy’s death. But even with the authorship of Malachy highly dubious, the list did still reach well beyond the 16th century and there’s been a cottage industry in trying to morph later popes to fit the pithy two to three word descriptions given. John Paul II was “the labor of the sun” because he was born the day of a solar eclipse. Paul VI was the “flower of flowers” because his coat of arms features the Fleur-de-lys. This is the power of vague prophecy. So long as enough people want to believe that past humans could predict our present (which is fun to believe, because it infers present humans can predict the future), there will be those willing to twist and turn a few vague words into grandly important statements. Most of the lines in the Prophecy of the Popes are two to three words long, and, with the exception of that last bit about Petrus Romanus, mention no one by name. The mental gymnastics required to fulfill some of the prophecies are fantastic. For example, the 100th pope in the prophecy is “From the baths of Tuscany” (when I say one or two words I mean in the original Latin). This is the Wikipedia explanation of why Gregory XVI fits: “Pope Gregory XVI belonged to the Camaldolese Order, which is said to have begun with two monastic houses. The first of these houses was Campus Maldoli, and the second was Fonte Buono, meaning ‘good fountain’ in Italian.” Nothing tying him to Tuscany, save that Tuscany speaks Italian. I don’t need to tell you how prophecy works, how vagueness is a feature and not a bug, and that’s ultimately not what this post is about. So let’s say you’re a member of the College of Cardinals. And, for whatever reason, you believe the Prophecy of the Popes. What do you do? It’s an unusual position in the best of times, to be one of the handful of individuals on the planet given a vote to elect a man who will have such a wide impact on the world, for better or worse. But to be in a position where you think you’re electing the last pope. Ever. The one who will be seated when, based on your interpretation, the church, the city of Rome, or perhaps the entire planet is destroyed. Given the ages of many Cardinals, each election they approach is likely the election of the last pope for the individual, but for the world as a whole? It’s questions like these that fascinate me about apocalyptic literature, whether prophecy or fiction. According to Wikipedia’s List of dates predicted for apocalyptic events, and article I enjoy enough to justify two Wikipedia references in one blog post, I have survived the apocalypse 68 times since I was born. Heck, I’ve survived Harold Camping predictions of the Rapture alone no less than six times. What draws people into the belief that they are living in the end times, and how do they react to that. And, assuming this reaction isn’t a tragic mass suicide like Heaven’s Gate, what happens when the date of the apocalypse comes and goes? I have, in the back of my head, the concept for a story where an entire society, perhaps an entire planet, counts years down rather than up. I don’t know where the story goes, but I know it’s set in the last few weeks of that countdown. What is that atmosphere? Is it the same atmosphere as a movie like Seeking a Friend for the End of the World where there’s a very concrete apocalypse incoming versus a vague sense of dread? Apocalypses, man. Am I right? There’s a broader theme behind the apocalypse in literature. It’s the ultimate mortality. It scales up all of our fears about death and spreads them out over an entire population. From a purely logical perspective, there are few differences between ones own death and a global apocalyptic catastrophe. Either way, one moment you’re alive, the next moment you’re dead. But that’s not quite right. There’s something so much more horrifying about the notion that you’re not the only victim. There’s no one carrying on, keeping things going, no next generation. It just…all ends. And that’s tough to wrap the brain around. Yet it’s been a concept haunting humanity. If one person could die, if one city could die, could everything die? It’s not worth stressing out over on a day-to-day basis, down that way lies madness, but it does turn into a powerful narrative tool. So be on the watch for Peter the Roman to ascend, though I suspect there will be any number of “reasons” why the next Pope should be considered such. Watch the skies for asteroids. And be careful of any impending raptures. You’ve probably seen it by now. If you haven’t, the news broke this week that Amazon filed a patent “to create a secondary market for used digital objects purchased from an original vendor by a user and stored in a user’s personalized data store.” Now, Amazon has its fingers in a lot of digital soups, so this would mean music, this means movies, but what most folks are focusing on is that this means ebooks. If you want opinions of people who matter slightly more than I, Chuck Wendig has posted about this, as has John Scalzi. Twice, in fact, with the second post making the point that he’d rather you pirate his ebooks than buy them used from Amazon if he’s not going to make money off of them. I know people are going to find that last point a little extreme and alarmist. I get where he’s coming from, but I’m not sure I completely agree. If you’re still here, then you get to hear my opinion. First, let’s pump the brakes on this a little. It’s trendy in modern reporting to focus on patents awarded to one company or another. Frequently that means focusing on patents awarded to Apple and Amazon. In the case of Apple, it’s an attempt to guess at what will show up in the next iPhone or iPad, though a huge number of the patents don’t end up in any electronics. It’s been with increasing frequency that patents aren’t about protecting a product you are preparing to sell, it’s to prove you had an idea first. It’s to keep other people from using that idea or, if they do, force them to license the idea through your company. This is the land of the patent troll. Note, I am calling neither Amazon nor Apple patent trolls. However, both company do have multiple patents that do not reflect current, or even future, products. It’s impossible to know whether this used digital object patent is such a patent or not. It will remain impossible up until the point Amazon rolls out the new service. However, let’s go with the assumption that Amazon will move forward, because assuming it won’t means my blog post ends here and I have nothing else to do with this space but post pictures of my baby or cats. This is not that part of this internet, this is instead the part where I opine about things I really lack enough details to really opine about. Alright, so let’s assume that Amazon is going to go through with this. They want to create a process by which you can sell back your used digital music, movies, and books, allowing someone else to buy it at a reduced price. What are the problems with this? To start, let me say that I am an unabashed fan of used bookstores. This past Martin Luther King Jr. Day when I found myself with a day off work and no wife or baby, I didn’t sleep in, I didn’t veg out with the television, or finally finish Dishonored. No. I went on an odyssey to visit seven used book stores in the Northern Virginia area. This weekend my wife and I are talking about hitting two more near Eastern Market. One day I’ll hit I-270 and do all three locations of Wonder Books. I love used book stores. And I understand something about used book stores. I understand that the purchases I make do not benefit the authors or their estates. Those books have already been bought new and the royalties paid out. While I mostly buy out-of-print titles and books by deceased authors when I go digging through the shelves, I do occasionally buy from a living author, one who would actively benefit from the royalty. That’s how I got the second and third titles of the Old Man’s War series. I’m not making a stand here that every book should be bought new, that any literary transaction should put money in the author’s pocket, because if I argue that I’m a hypocrite and turning my back on every one of those used book stores that I so dearly love. This is where things get a little thornier. If I go into a used book store and buy a copy of Old Man’s War, I know that the person who originally owned it and read it sold it to that used book store. That he or she no longer owns that copy. In theory this is the case with digital media. In practice, it’s not. While breaking DRM on digital media is illegal, there is software available to do exactly that. So there’s no guarantee that the digital copy of Old Man’s War sold back to Amazon doesn’t also still exist on the original purchaser’s computer. Or another Kindle. Or anywhere else, really. And, actually, Old Man’s War is a horrible example anyway, as Scalzi’s publisher is quite proud of the fact they no longer use DRM, so that makes this problem even more challenging. Amazon may have considered this, they may have a solution. Again, we don’t know. So let’s go back into that used book store and its science fiction section. When I go into Hole in the Wall Books, or Wonder Books, I know how many copies of Old Man’s War they have. In my experiences this is typically between zero and two. As a consumer, I know when they sell those two copies they have no other copies. Amazon will need a hell of a lot of transparency with this particular issue, proving that they are only selling the number of used copies that they have the authority to sell. I doubt the methodology for moving these used copies will be keeping a copy of the file in some separate folder then deleting it when someone else buys it. No, it’ll come as a copy from the same master file that they use when serving up any other request for the book. I’m not saying I don’t trust Amazon in this respect, only that writers shouldn’t have to rely on nothing but their trust of Amazon. After all, the words “Amazon” and “transparency” do not go hand-in-hand. However, that does raise another point. What actually makes this copy “used.” I’ve bought books from used bookstores with brittle pages, with broken spines, with covers nearly coming off, with notes written in them. 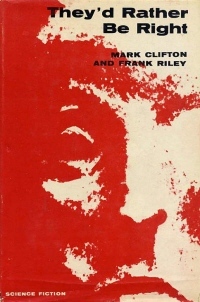 I’m paying less money (well, that’s usually a lie, I’m often buying books labelled as 35-75 cents originally for $2-5), but I’m also getting a copy of the book that isn’t in nearly the condition that it was new. If used ebooks are served from the same master file…what makes them used? What’s the difference in the file I receive, other than the price? This creates an incentive to buying the books used. Which means an incentive towards the copy that doesn’t produce royalties for the original author. If I can get the exact same file for less…why would I pay more? As long as there are “used” copies on hand, would anything drive people to buying the “new” copies other than some loyalty to authors and creators. Most people don’t have that. Which meshes in nicely with the question of how Amazon proves they’re only selling as many “used” copies as they have. Again, with any or all of this, Amazon may have considered these problems and has solutions in place. There’s no way of knowing this is how Amazon will work the market, they may simply provide a service to link sellers with buyers while skimming just a little off the top. Or they may act as the internet’s new used book store, the alibris of electronic copies, and take a much larger cut. Amazon may even intend to compensate creators for used copies moved through this process. Amazon may not even do a thing, and just wants the patent to keep anyone else from doing it. We don’t know their plans right now. That doesn’t mean that we can’t voice our concerns or look at the possibilities of what’s to come. There’s no reason to necessarily distrust Amazon, but there’s also no great reason to trust them, either. They are a business looking out for their own interests, and they are increasingly such a massive share of their market that they can dictate terms. We’ll just have to wait and see what those terms end up being, and hope that they don’t negatively affect the ability of creators to profit from their intellectual property. Lance Corporal Gunderson glanced around the enlisted mess of the SN Raptor, his new home for the next seven months en route to Pavel’s Planet. He’d only recently been activated from the Earth Marines and was still getting used to life on ship. Sure, gravity pulled down, but there was something different about the artificial field. Sure, there were stars out the window, but they had a rather distressing tendency to not stay in one place. He’d been through the eternal night of space in his training on Luna, but the stars, man. The stars. The tables were self segregated, with the smaller Space Navy crew that ran the Raptor occupying a few tables and his new battalion filling the rest. He recognized the face of Private First Class Murphy at one of the tables. Space Private First Class, he corrected himself as he set down his tray of chipped beefite on toast. Murphy shushed him and waved his hands violently. The room took on a brief quiet, from all tables filled by the marine battalion eyes now stared at him. “There you go again!” Murphy looked at the other tables. “It’s okay, he didn’t know. I’ll get that beat out of him.” Eyes turned back to their breakfasts, Gunderson could only be confused. “Because,” Murphy interrupted. Gunderson bristled. “They offered one where you got to pretend to go and fight an alien horde. As marines. In space. And they called them…” He trailed off, rolling his hands. Gunderson didn’t answer. He put his fork down and stood away from the table. “Don’t do it, man,” Murphy said, pulling on Gunderson’s sleeve. He was dead before he hit the ground. The enlisted mess now smelled of crackling ozone and cooked blood. Gunderson lay on the floor, a smoking hole in his back from the plasma discharge.